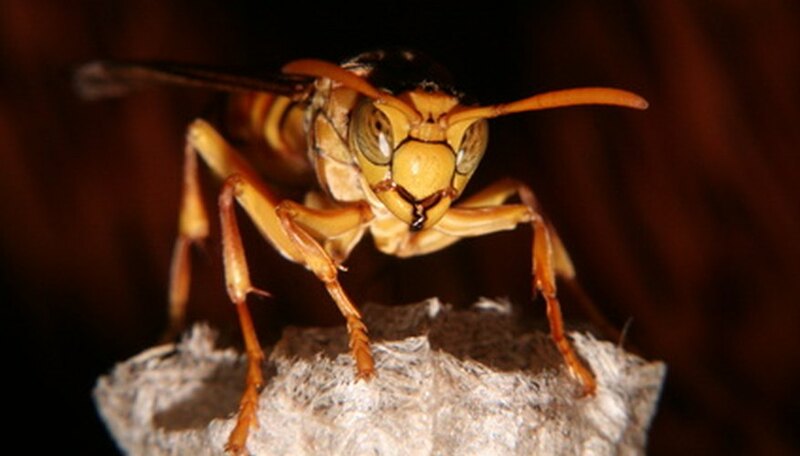 Many people are frightened of insects that have the potential to sting--hornets included--but these social wasps hold an important place in the ecosystem. They destroy nuisance insects, reduce fly populations and generally avoid humans while doing us these favors. For hornets, the rule seems to be if you leave them alone, they will leave you alone. If you would like to attract some of these predators to your area, tempt them with flowers. And if you want to keep them away, avoid including these flowers in your yard. Hornets will visit flowering fruit trees trees to harvest the bark, sap and insects that feed on the sap. Hornets enjoy fruit trees for their flowers and for the eventual ripened fruit crop and fallen fruit bounty to be found scattered on the ground beneath. Apples, pears and peaches are available in dwarf varieties, with sizes suitable to city landscapes, or standard sizes for country orchard settings. If you have fruit trees, when harvesting fruit from the area, wear shoes, proceed with caution and try not to crowd any hornets or bees you see foraging. Hornets also are attracted to flowering bushes, shrubs and ornamental trees due to the flowers, sap and insect prey that visit. Examples include lilacs and wild plum, hydrangeas or willow. Sweet fruit crops such as watermelon, muskmelon and honeydew will create attractive flowers then aromatic fruits, which will draw hornets into your garden space. Berries, such as strawberry runners, raspberry canes or blackberries, are also popular with these social wasps. Nectar-producing flowers bring hornets to the yard because hornets feed on both the fragrant secretions and the insects that come by to enjoy a meal. As a bonus, many of these same flowers entice butterflies and hummingbirds. According to the University of Minnesota Extension, annuals “bloom continuously through the season, providing a steady supply of nectar.” With this steady supply, hornets will remain in the area. Nasturtium, petunia, aster and bee balm are some examples of such nectar-producing annuals. Perennials include yarrow, purple coneflower and butterfly weed. Gardeners who use a combination of annuals and perennials, shrubs and fruit-bearing plants are likely to have more hornets because their location will provide a food source throughout the growing season as the blooming periods overlap.